Invisible Kingdom #1 is due out 3/20/2019. By Zack Quaintance — Invisible Kingdom #1, the new comic coming next month from writer G. Willow Wilson and artist Christian Ward, is perhaps the next evolution of the ongoing creator-owned sci-fi comic boom. A complex and weighty piece of work, the book uses Ward’s unique (and absolutely stunning) brand of psychedelic space art in tandem with Wilson’s ideas about societal foundations ranging from religion to commerce to forge ahead into new thematic territories. It’s not alone in doing this—Wasted Space and Relay both come to mind as close cousins to this comic—but in its debut issue, Invisible Kingdom seems to offer a new and perhaps more realistic sort of take on this genre. There’s always that character on distressed sci-fi vessels, the C-3PO who’s fretting is designed to remind the audience exactly how implausible the heroics of braver protagonists are. That character, however, is usually exclaiming some sort of bonkers world-specific jargon or a quick throwaway joke. In Invisible Kingdom, that character reminds us of the ever-looming presence of economics. The book doesn’t apply this plausible lens to just economics, either. Within its intriguing and aesthetically-powerful world, it gives us similar glimpses into religion, governance, and the way different species react to/treat one another. The end result is a relentlessly thoughtful comic, as well as a sense of narrative confidence that makes it easy to trust these uber talented creators from the book’s earliest pages. Also, I’ve peppered compliments to Christian Ward’s artwork throughout this piece, but, and excuse me for this, I don’t think I’ve come anywhere close to doing Ward’s contributions justice. The best comics are such an alchemy of creative collaboration it can be tough to evaluate individual elements. This is certainly one of those books. Everything comes together seamlessly, and the end result is greater than the sum of its pieces. Ward’s artwork, however, is—to borrow an Internet phrase—next level good. There isn’t a bad-looking segment, page, or even panel in this entire comic. On the contrary, there are actually several that left me absolutely stunned (that word again!) when I passed over them. The colors, the character designs, the facial expressions, the panel sizes and composition...it’s all so mind-bendingly luscious and just plain good. Ward has long been a talented psychedelic artist, lending massive talents most recently to Marvel’s Black Bolt. This book, though, has the trappings of a sequential art masterpiece. And for every smaller, detailed panel with a green-skinned character gritting their way through a challenge, there’s a subsequent splash that could be framed and hung on a wall somewhere in a hip loft apartment. Story-wise, this is an advanced review so we have to tread carefully here, but I think it’s okay to divulge that there are a pair of plot concerns: one related to joining a religious order and another to embezzlement. This is a dense first issue that has to work hard at world-building, so the characters are a bit lightly-defined at the start. That’s OK. Comics like this need to progress further to, to set up world rules and concerns before they can really show us who are central figures are, what they most care about, and why. We do get some great philosophy here and there, enough to draw us into the story further. My only real regret is I’ve read this book so far in advance, it’s going to be a painful long wait for Invisible Kingdom #2. For more comic book reviews, check out our review archives. Zack Quaintance is a tech reporter by day and freelance writer by night/weekend. He Tweets compulsively about storytelling and comics as BatmansBookcase. Sign up for the weekly newsletter from Batman’s Bookcase! By Zack Quaintance — Every month, I work diligently (by reading comics) to catch up with books I’ve heard quite a bit about but just haven’t had a chance to sit down with for whatever reason. This, I’m happy to report, generally leads to me finding new stories that I like a lot, as well as a good number of new writers and artists I was previously unfamiliar with, although that’s not the case this month. From Martin Morazzo’s artwork on Ice Cream Man to Dan Watters’ recent Vault Comic book Deep Roots, this month’s new discoveries feature creators I know and like. What’s new (obviously) are the exact books they worked on. Our first entry, She Could Fly, comes from Dark Horse’s excellent Berger Books imprint, started and overseen by former Vertigo editor Karen Berger, who was at the helm there for that imprint’s greatest successes. Between this one and Seeds, it’s quickly becoming clear just how much potential an imprint like this one has. And with a collaboration from G. Willow Wilson and Christian Ward coming next year? Oof, we’re in for some good comics. Anyway, enough about future good comics! Let’s check out this month’s new discoveries! She Could Fly #2 cover by Martin Morazzo. She Could Fly has one of the most intriguing first pages of a comic I’ve read in some time. It’s a simple page, three panels and 10 words. A woman flies high in the air as people watch below. She could fly. I saw it. With my own eyes. And on this page we get our first glimpse of our hero, looking shocked and enraptured, mouth agape and eyes wide. The book, really, only gets better from there. For someone who is ostensibly not a comic writer—not primarily, anyway, given his background in TV—Christopher Cantwell’s economic storytelling throughout She Could Fly does an incredible amount of work. There’s much character interiority, cluing readers in on fears and concerns and priorities, on what this world is like for the principal characters within it. She Could Fly features extra-sized issues, 32 pages of story in each, yet never feels bloated. It’s a lean and relatively quiet series with varied interests, much like its Dark Horse Berger Books imprint mate, Seeds (another of my favorite comics right now) and like the second entry on our list today, Limbo. She Could Fly contains explorations of mental health (that’s the big one), media, physics, governmental versus private sector research, transcendental meditation, and christianity, which outwardly don’t seem to belong together but squint a bit and you’ll see the connections. Something that works well here is the aforementioned focus on mental health. The protagonist’s condition is unspecified (in back matter, Cantwell notes he’s dealt with primarily obsessional OCD), and the creators lean into her mental health problems to blur reality, leading to striking visuals and questions about what’s real. I found She Could Fly captivating, a great use of the sequential graphic medium, almost like a novel in that it patiently developed multiple characters (and their priorities) while maintaining a deep focus on interior lives...and then slammed everyone together. It’s one of the most immersive comics I’ve read all year, due in large part to the art of Martin Morazzo, who just gets Chicago so damn right. I’m from that city, and Morazzo’s art nails every detail, street scenes to the insides of restaurants, all of which have a distinctly provincial feel. Also, one thing I’ve admired about Morazzo’s work in Ice Cream Man (see our July 2018 New Discoveries) is present again here: visuals seamlessly move between the horrific and mundane as Morazzo organically depicts monsters within an otherwise grounded world. Tremendous work from all involved, She Could Fly makes good on the promise of the Berger Books imprint. It’s a comic that feels at once vital and urgent yet is also steeped in an assured command of craft. So glad I finally had a chance to catch up with this one. Limbo #3 by Casper Wijngaard. Limbo is a story of an amnesiac, inherently hazy. It’s also a detective story...in which a man who can’t figure out who he is seeks answers on behalf of others. There’s power in that, although the book isn’t all that interested in exploring it. Instead, this story ricochets between thrilling pivots, until Limbo becomes...well, something else, something different than you were expecting yet clearly telegraphed by the comic’s title. Most importantly though, Limbo is indie comics at its best, imaginative and unrestrained, using its creators’ interests in music and media and the occult to craft a story rich with aesthetic pleasures and suspense. Set in the fictional city of Dedande (analogous to New Orleans), Limbo is pan-cultural, drawing from many mythos as it progresses (although it's most-rooted in voodoo). Familiar bits are brought together in interesting and unfamiliar ways as the creators use hard-boiled detective noir tropes to ground things. None of that would matter, however, if this story wasn’t so well told. Basically, Limbo is high concept, bordering at times on downright abstract, but it’s also an exercise in breakneck and successful plotting. Watters voice is fantastic. In the tradition of Mike Mignola, he uses wry narration or blunt asides to let readers know, yeah, I’m in on the jokes, too. In one panel, the narrator explains how Sandy uses dance to contact the dead, and in the next he acknowledges Yeah, I know how that sounds. It’s a whole thing. Elsewhere, the hero tells a lecturing villain, You’re just monologuing now. No one likes a monologuer. It’s a time-tested writer’s trick, one I find endearing. Meanwhile, there’s a bit of Michael Oeming in Wijngaards art and a bit of Steve Lieber, both of which I mean as high compliments. Wijngaard’s work is so well-realized at times it transcends, stimulating other senses, specifically hearing. His use of colors is also vital to establishing mood. It all adds up to a book I’d recommend to any and all fans of the comic medium. The complexity may be off-putting to some, but it’s a risk everyone should take. The reward for those who get into Limbo is massive. Invasion From Planet Wrestletopia #1. 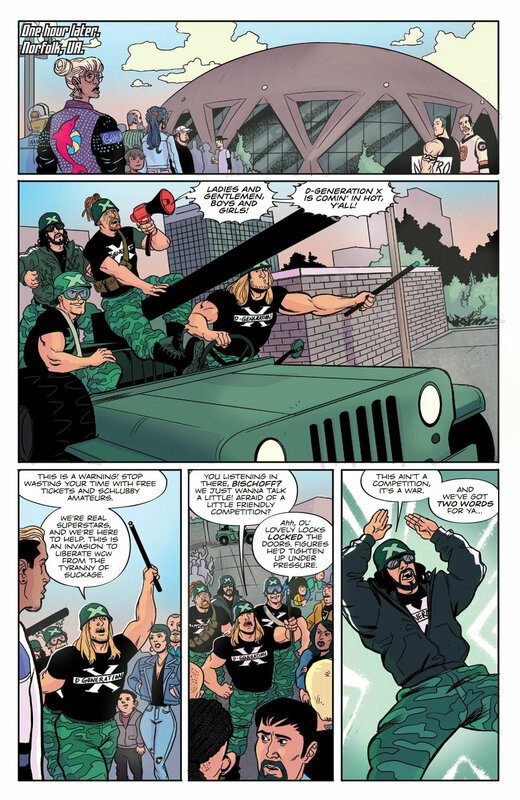 Shifting gears, let’s look now at Invasion From Planet Wrestletopia, written by Ed Kuehnel and Matt Entin, art by Dan Schkade, and colors by Marissa Louise. Whereas the two previous books on our list were almost topographical pastiches, Invasion From Planet Wrestletopia lives within a niche: professional wrestling. It extends deeper into comic book-y territory, however, by also adding a sci-fi angle. This, simply put, makes for a hilarious comic. There’s an obvious love of professional wrestling, an appreciation of its spectacle and hammy insularity, and it’s put to good use, be it for jokes or for more subtle, character-drive moments. There are essentially two plotlines at work in Invasion From Planet Wrestletopia’s first issue: one about a cocky (and, to be fair, probably mishandled) wrestler who tries to distance himself from a promoter (not for the first time), and another about the titular Planet of Wrestletopia, a planet upon which culture and society is shaped entirely by pro wrestling. They do, of course, stand to eventually meet. More importantly, though, this space stuff allows for so many great gags (for example, instead of referring to a monarch as your highness on Planet Wrestletopia it’s your championess). It’s all very clever and a whole lot of fun. If you’re a fan of pro wrestling (lapsed or current) there’s just so much to like about this comic. Check out Invasion from Planet Wrestletopia now! See all our past months of new discoveries here. And check back to the site next week for our Best Debut Comics of September 2018. The Seeds debuts Aug. 1. By Zack Quaintance — I’ve hoped for a while that a book would examine some of the themes in The Seeds #1. I’ve wanted a story (one with a smarter concept than I could casually drum up) that takes a hard and knowledgeable look at our current media landscape, how it got this way, where it’s going, and what stands to happen to society as a result. That’s quite a big ask, I know, but, hey, I can hope. With The Seeds #1, it seems my hopes have been at least partially satisfied. This comic is definitely concerned with media (also sexual dynamics and the environment), and in its first issue (of four) media is an interesting and prominent theme, especially throughout a pair of nine-panel grids wherein our protagonist Astra talks indirectly about the state of the media with her editor Gabrielle. Gabrielle discusses how rumors and falsehoods that get repeated become true, how sometimes it’s what people want, how truth seeming pliant is a fine justification for inventing stories, and how—more than anything—their outlet needs a scoop. The takeaway, as I read it, is that when you call the media fake long enough, the media eventually bends to that perception. It’s to the book’s credit that this is conveyed via such a well-done, smart, and natural interaction, one that simultaneously raises questions about our own society while establishing baseline facts about the dystopian world of this story. I liked it. And, really, I liked The Seeds quite a bit. The book is part of former Vertigo editor Karen Berger’s Dark Horse imprint Berger Books, and like other entries in that line, it features veteran creators playing out intricate and literary ideas with little regard for accessibility. The book is written by journalist/documentarian/comic writer Ann Nocenti and drawn by David Aja (Hawkeye), a powerful creative team with powerful aspirations. It's also a team one can trust to tell a satisfying story. Atop its underlying complexity this book has many great understated character moments. There’s a love story afoot, one in which one party is duty-bound to refrain while the other is hesitant because the first party says their leaving—it’s a story to which many readers will relate. Moreover, this is a comic that rarely goes page without a really freaking cool ideas of imagery: a nightlife venue called Club Death that simulates dying, a naked figure in a gas mask beneath a giant American flag with a shotgun and an old TV, a lunch of deep fried bugs. Casually bizarre and fantastic. Basically, if you’re into stuff like pop art or pleasantly-abstract indie filmmaking, chances are you’ll dig this. For more comic book and movie reviews, check out our review archives here. 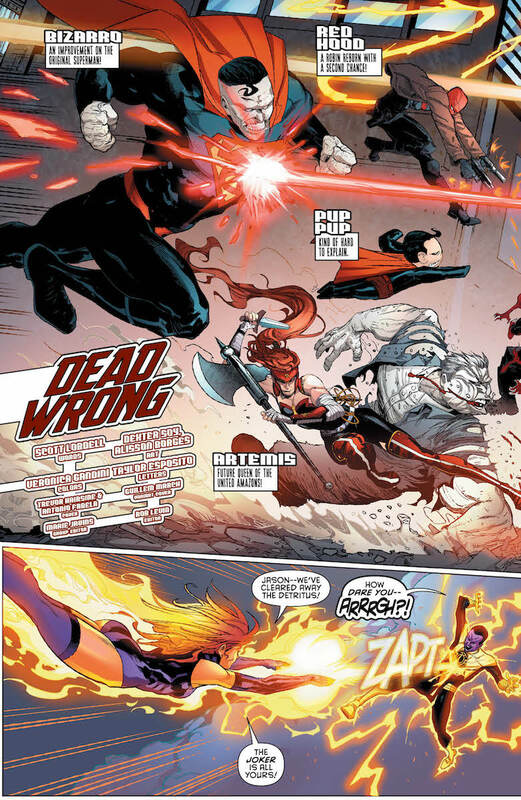 By Zack Quaintance — With nearly every publisher in comics readying for San Diego Comic Con (which is now less than two weeks away), the release of new interior art previews was slow this past week. Boom! Studios shared a new wrestling book that we were surprised to find ourselves so interested in, and Valiant Entertainment was as conscientious to show off its work as always. In other words...we still cobbled together five comics previews for this section! Oh, plus we dug back a few months to look at one of August's most exciting comics. The bees are swarming. What do they know that we don't? The rich have built walls around their wealth and scramble into escape rockets. The romantic and the ruthless cross over into the lawless wilds of Zone-B. A few cantankerous aliens have come to collect the last dregs of humanity's essence for the celestial embryo bank. One of them falls in love. Astra is an idealistic journalist who stumbles into the story of a lifetime, only to realize that if she reports it, she'll destroy the last hope of a dying world. How far will she go to get her story? An eco-fiction tech-thriller where flora and fauna have begun to mutate, The Seeds is also a story of love beyond race and gender, and of the resilience of both human and animal kind. A new four-issue series, by award-winning artist David Aja (Hawkeye, Immortal Iron Fist) and filmmaker, journalist, and comics writer Ann Nocenti (Daredevil, Catwoman). For mature readers. Our Take: This was the comic we weren’t most excited about when former Vertigo heyday editor Karan Berger first announced this imprint, and that hasn’t changed. 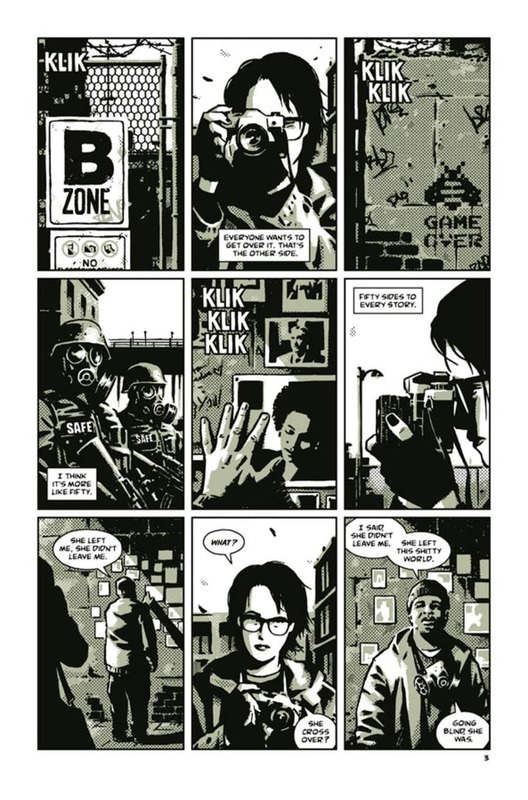 David Aja is an all-time great comic artist based on his run with Matt Faction on Hawkeye from a few years back, and we love that he’s teaming with writer/filmmaker/journalist Ann Nocenti. This will be a very good comic. To save his daughter’s life, Bloodshot brokered an unthinkable bargain…and has been thrown forward two thousand years in the future to 4002 A.D.! But preserving life requires a sacrifice…and now, he’s on the hunt to take out the one man standing between him and the safe return of his family! Too bad the only thing standing in his way is…Bloodshot? When the 41st century’s Bloodshot finds out Ray Garrison has come to town, all hell is bound to break loose! Eisner Award winner Jeff Lemire (Black Hammer) and master storyteller Doug Braithwaite (X-O MANOWAR) are about to pull the pin on the next explosive chapter of “THE BOOK OF REVELATIONS” with a centuries-spanning gunfight for the ages! Our Take: This is the penultimate issue of Jeff Lemire’s years-long Bloodshot sage. You better believe we’ll be there for this (just like we will next month’s finale and the relaunch in the fall with the stellar, Lemire-endorsed rising team of Zac Thompson and Lonnie Nadler at the helm). Our Take: This one-shot looks like a fantastic jumping on point, and we like to review those (as well as read them, though we've been up on this Ninja-K run from the start). With a new set of creative teams coming in the fall, there could be a wave of fans heading toward Valiant. We've always found Ninjak to be Valiant's most accessible character, which is enough for this book to get our endorsement. Bizarro is getting... worse. Worser? Worsest. The backward Superman's diminishing cognitive state is causing problems for the rest of the Outlaws. Complicating things is the Red Hood's vendetta against the Penguin-can the Outlaws stop Jason Todd from crossing a line he can't return from? Our Take: We've really liked what Scott Lobdell has done since this book relaunched as part of Rebirth, and we've been following/enjoying the degenerating Bizarro storyline and we don't have plans to stop now! Our Take: We know there's a lot of overlap between comics and wrestling fans, but we haven't really been part of it. In fact, the last time we were really into wrestling (not counting the Mickey Rourke movie, The Wrestler) was the WWE's attitude era. So, when we opened up this preview, we didn't expect much...and then it all came flooding back. This looks like a fun one-shot for wrestling fans in the late '90s. Very cool.